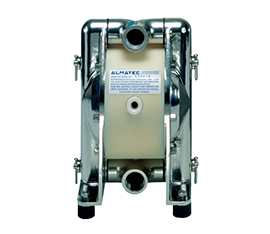 Almatec is a premier manufacturer of air-operated double diaphragm pumps with a worldwide presence with close proximities to end-users via their distribution network. As part of PSG, in the America’s they work through the Euro-Center based in Grand Terrace, California, which provides America’s distributor and end-users local service and inventory. Permanent product innovations and improvements have resulted in a large range of products and the opening of new markets for Almatec. The extensive product range offers sophisticated and economical solutions for all applications. 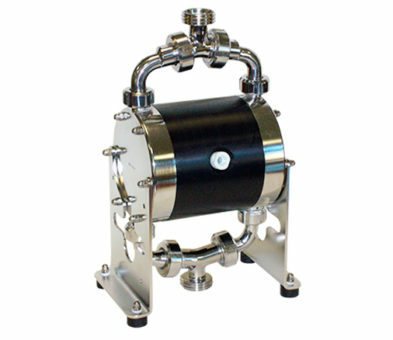 The standard-setting advantages of pneumatic (or air-operated) diaphragm pumps include protection against dry running and overloading, self-priming capability, infinitely control, easy start up, no rotating parts in the product stream, solid handling capability and gentle displacement. The quality requirements of their pumps is high. Solid design, Perswing P® air control system, diaphragms and best-in-class materials are quality features demanded by their customers. 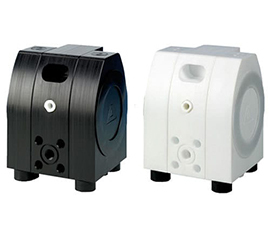 The Almatec E-Series represents the latest generation of plastic air-operated double diaphragm pumps made in solid design. The housing parts are tightened to each other via housing bolts, however, instead of single bolts pressing punctually against the housing, all the housing bolts are tightened against a diaphragm-sized ring. This structure results in even spreading of the bolt force in an increased permissible bolt torque, which leads to increased pump safety. Advantages to the machined plastic design include, reduced noise level, optimized flow pattern, maintenance free-air distribution system and an option to easily add a pulsation dampener. The E-Series is made of Polyethylene, PTFE, and conductive Polyethylene or PTFE with options of EPDM, PTFE/EPDM, NBR elastomers. Applications include abrasive slurries, solar cells, and aggressive chemicals to name a few. The Chemicor series is designed for a variety of liquids, viscosities and applications. The Chemicor series is a metal air-operated double diaphragm pump with soft contours, smooth flow channels and no dead spaces. Advantages to the Chemicor series include rotating inlet and discharge parts, easy start up and easy cleanability. 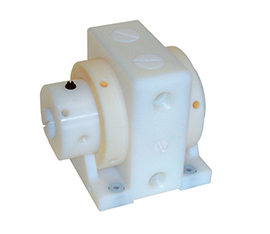 These pumps are designed with a Stainless Steel housing and EPDM or PTFE/EPDM elastomers. The Biocor series is designed for sterile applications within the pharmaceutical, biotechnical and food industry with its certifications for EHEDG, FDA and ATEX conformity. This pump has a special design with an integrated cleaning system that enables Clean in Place and Sanitize in Place capabilities. Advantages of this pump are the sterile design, drainability without disassembly, high surface quality and increased reliability lead to a dependable sanitary pump. Materials of construction include Stainless Steel and PTFE or EPDM (FDA approved) elastomers. up to 1 ¼”) pumping up to 26 GPM. AHD / AHS– These High-Pressure diaphragm pumps are designed for charging filter presses with chemical wastes and special sludge. All housing parts are made of Polyethylene UHMW, which gives superior abrasion resistance. These pumps have the ability to run-dry, self-prime and automatically adjust pressure/quantity as the filter press fills up. There are 3 sizes (1/2” up to 1 ½”) that generate flows up to 87 GPM and pressures up to 218 PSI. CXM– These pumps are used as general purpose pumps for low to medium duty and also as drum pumps. All housing bolts are tightened together against a diaphragm-size ring on the housing resulting in consistent flow of forces and increased bolt torque, ultimately increasing pump safety. These pumps are made of conductive Polyethylene and come in seven sizes from 3/8” up to 1 ½”. Flows up to 35 GPM and pressures up to 100 PSI, make this an ideal all-purpose pump.